There’s an old saying that firewood keeps you warm twice: Once when you’re cutting it and once when you’re burning it. 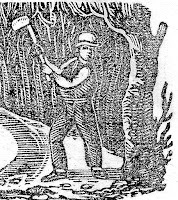 But that’s not why winter was the time for woodcutting among the old farmers who lived in town a century or three ago. Winter was woodcutting time for more practical reasons. First and foremost, farmers had the time – there were no crops that needed tending in January and February. In winter, it was easier to pull large loads of wood on a sledge or “stoneboat” because the winter woodlands were usually covered with snow or ice and the forest floor did not have much of the thick underbrush that made travel among the trees difficult at other times. The wood was drier in winter, lacking the sap found in spring, summer and fall. Logs would season more quickly and be safe and ready for the following winter’s home fires. Good farmers loved the outdoors and always needed something to do. Wood was their winter harvest.